Highland Park 21 Year Old Single Malt Whisky is placed by whisky connoisseurs as one of the best examples from this popular distillery. Originally this was only available in global travel retail and duty free markets, but now it is on more general release. This whisky took the accolade of Best Single Malt of the Year at the World Whisky Awards 2009. 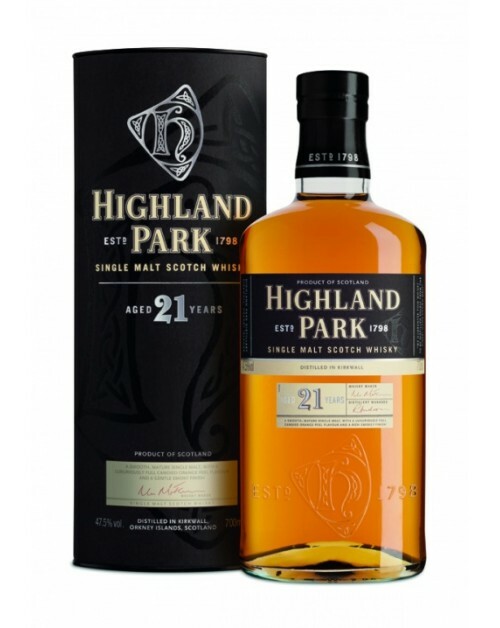 Released in October 2007, Highland Park 21 is a fulsome flavoured, imposing, sweet single malt with a rich smoky finish. Nose: Sweet Sherry with a hint of balsamic. Leads you to a centre of old fashioned fudge. Palate: Prevalent sweetness; aniseed balls and Muscovado sugar. Some smoke with warm apple pie. Finish: Spicy raisins with aniseed hanging around for a drawn out, exotic end.